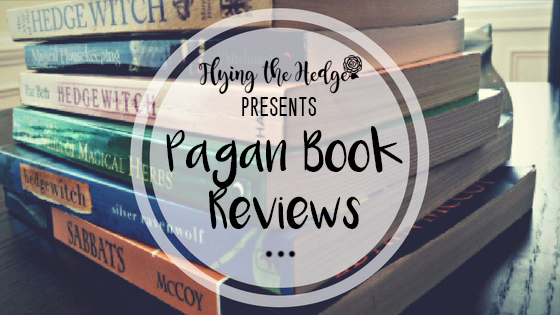 Another book review! I've been home so I've been reading quite a bit lately. Just one book away from twenty-four this year. Maybe next year I can read more? The latest book I finished is Garden Witchery: Magic from the Ground Up by Ellen Dugan. Any hedgewitch or witch interested in herbs and herb magic MUST read this book! As always I will begin with what I didn't like. Honestly, I don't have any complaints. While the book is fairly simple and based on Wicca, it still provides excellent information and even options for more advanced practitioners. The only section I felt was out of place was the chapter on the sabbats. While I enjoyed reading what her family does for the holidays, it seemed a wee bit out of place with the general theme of the book. This book, however, was fantastic all the same! 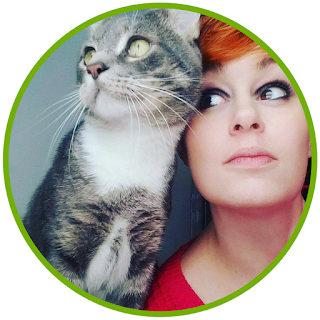 Dugan is an experienced witch and gardener, making her an expert in garden witchery. I am in the process of planning our front yard for next year and this book was incredibly helpful. The floral language, plant correspondences, general gardening tips, and how the moon cycles affect gardening were wonderful! I cannot wait to add them to my grimoire and start my own gardening journal this year. There are wonderful plans to create themed gardens, including a faerie and Gothic gardens, and notes on how each plant will do in your area making this book an excellent resource. While I have many books on gardening and herbs already, Dugan's book is by far the best thus far in regards to magical planting. Her stories and writing kept me engaged throughout and encouraged me to think through what I want from my garden. All the ideas running through my head cannot wait to take shape! However, Dugan reminds her readers to keep realistic expectations; start small. It takes years to grow a large garden and it is an ever-changing process. Furthermore, Dugan offers a host of spells, rituals, and crafts you can employ to grow a magnificent garden, attract faeries, and bring peace and healing to your family. She also provides a basic guide to spell crafting using your herbs and flowers, reminding her readers that the magic comes from within us; all the extra stuff just helps the spell along. She encourages her readers to memorize correspondences, a suggestion I strongly endorse. Memorizing and utilizing the correspondences separates the novice from the experienced witch. Overall, I give this book 5 stars, making it a must own for any hedgewitch or witch interested in herbal magic, lore, and remedies. It is an outstanding book, one I will be returning to again and again throughout my magical life. As the year nears its end, have you managed to squeeze in any magical reading? If so, let me know! I always love expanding my library! Yule is a time of giving, honoring life, and celebrating the birth of the Sun. I believe many people get so caught up in giving and receiving presents that they often forget to honor the Earth and all her creatures as well. I'm not trying to down play giving to other humans. Charitable gifts, volunteering, and loving our families is wonderful and in the spirit of the holiday. However, Mother Earth gives to us year around and her and her creatures deserve a thank you as well. There is a gorgeous evergreen in our backyard. I'm not sure if it was planted as a live Yule tree by the previous owners or if birds brought the tree with them, but it is perfect for honoring Mother Earth and her creatures during Yule. I decided this year I would decorate it with edible ornaments and garland for the wildlife to enjoy. After all, they bring me and mine tremendous joy year around. This is also a great way to let Mother Earth know I appreciate her and all she is provided me with this year. This is actually a very simple recipe that can be used year around to create all sorts of bird feeders. Make ornaments, suet feeder blocks, toilet roll feeders, and more! First combine the flour, water, gelatin, and corn syrup in a large mixing bowl. Stir until well combined. Add the birdseed slowly to the mixture and stir until it is well coated. Place the Yule-themed cookie cutters on the waxed paper and spoon the birdseed mixture into them. Pack it down tightly. You can use a measuring cup or a cup (anything with a flat bottom) to pack the birdseed mixture down and make the surface flat. Using the straw, poke a hole through the top of each birdseed ornament. Make sure it goes all the way through as this is where you will feed your twine or ribbon through to hang them. Allow the molds to sit for 2-3 hours. Once they are dried and set, gently remove the straws and cookie cutters. Allow them to dry for at least 2-3 more hours, preferably overnight. Once they have dried, cut your ribbon (roughly 4 inches) and carefully feed it through the hole. Hang them up outdoors and enjoy watching the wildlife! This has to be one of my favorite things to make and I am not entirely sure why. For some reason I love stringing things together. You can use a variety of fruits, vegetables, and nuts to please a wide array of wildlife and add color to your outdoor Yule tree. If you haven't already done so, pop the popcorn. I had use the stove because I don't own a microwave. Yeah...scandalous I know. Thread the needle with the string or twine and begin stringing cranberries, oranges, popcorn, and peanuts in the shell. I decided to do roughly 6 feet of garland for my tree since I was adding other decorations for the wildlife as well. If you want, layout a pattern before hand. Be careful with the popcorn; it has a habit of falling apart rather quickly. If you are using popcorn, don't place outside if rain is expected over the next couple of days. The popcorn will disintegrate before the wildlife is even able to enjoy it! These ornaments are much simpler to make and only require three ingredients. Birds and other wildlife LOVE apples and peanut butter! Be sure to hang these low enough for the deer to enjoy. Apples are one of their favorite treats! 1 Apple, sliced and cored. Spread you a sheet of waxed paper. Smear one side of the apple with peanut butter and dip in some birdseed. You want to make sure the peanut butter is completely coated with birdseed. Place on the waxed paper. Continue this process until all of slices are complete. Cut some lengths of twine and tie through the cored apple slices. Hang on your tree and enjoy watching the wildlife! Be sure to hang these low enough for the deer to enjoy as well! And there you have it! Three wonderfully simple projects to bring some joy and cheer to our animal friends and honor Mother Earth for all she provides for us. I also added some orange slices to brighten up the tree and be another little snack for all the animals that visit my yard. I think it turned out rather nicely! A couple of years ago I saw some beautiful felt trees in the holiday section at Target. I decided I could make my own for significantly less and set off to the store to buy some paper mache cones, green felt, and red pompoms. Guess what! They have been sitting in my storage closet since. I sat down 2 weeks ago and began cutting out the felt and realized it wasn't work it. I didn't even want dark green trees anymore! Plus, it was starting to hurt my hand. No one wants that. So I ventured off to Pinterest to gather some new ideas. That is when my ribbon Yule trees were born! My library is green, pink, and white with splashes of brown. 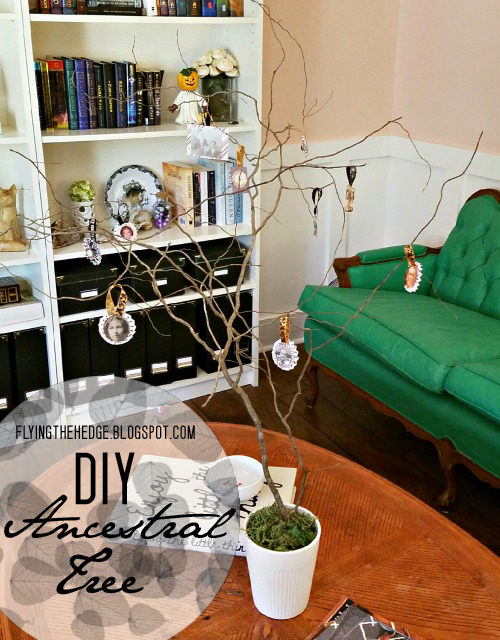 I wanted my ribbon trees to watch my living room so I set off to find pink, green, and white ribbons! My husband calls the library the Neapolitan room. Not gonna lie, it does make me want ice cream whenever I am in there...or tea. Same thing right?! 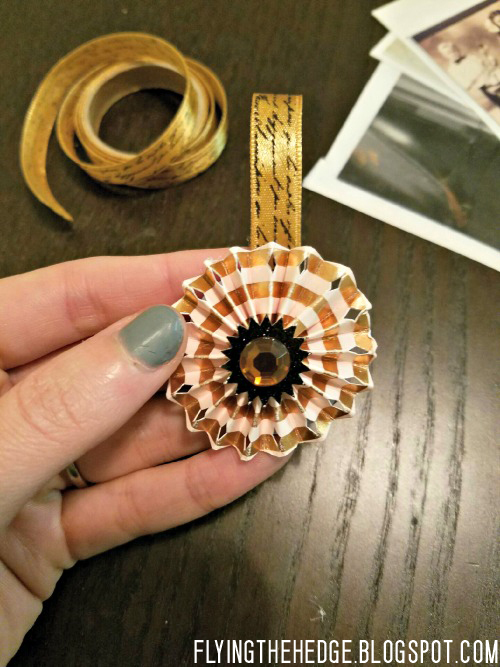 Begin by using the cone to draw a circle the size of the base on the cardboard. Cut out the circle just slightly smaller than the base. You want this circle to fit up inside the cone slightly. Hot glue the cardboard circles into place. Next, paint the paper mache cones. If you'd like, you can also spray paint your candle sticks. I liked the glass look so I kept them in their original finish. Allow to completely dry. While the paint is drying, begin cutting strips of ribbon 2- 2.5 inches in length. I cut about 20 strips and worked with them until I ran out. If you want, feel free to cut an entire roll. It takes just over 1 rolls of each color to complete the larger cone if you are only doing it in two colors as I did. Twist the ribbon to form a loop, and begin hot gluing the loops to your cones starting at the base and working upwards. Make sure to stagger and overlap the loops to cover up the bulk of the cone. You want your trees to look full. Finally hot glue the candlestick to the cardboard base and viola! beautiful ribbon Yule trees! If you would like, you can add glitter, colored pompoms, doll-sized ornaments or tree toppers, or even fairy lights to add some dimension to your trees. I used glittered gold ribbon which was enough for my tastes. Very magical indeed! 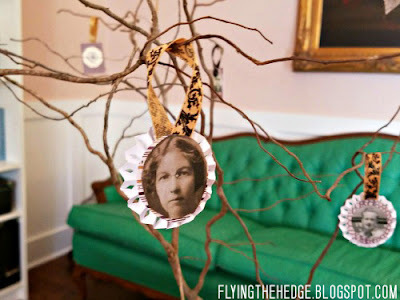 Have you done any Yule inspired crafts this year? Did you try this one? I'd love to see pictures of your work in the comments! Boy oh boy is this post LATE. 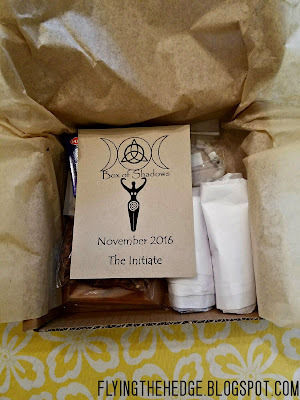 November's Box of Shadows was actually really nice and developed around the beautiful full moon we had last month. Unfortunately, I didn't check my mail until AFTER the full moon so I didn't get to use any of the box to celebrate last month. And because I have been so busy, I didn't have time to review the box either. Honestly, I opened it, rummaged through it, and tucked it away in my closet with my other witchcraft stuff. I'm still looking for an altar so everything is still boxed up which makes my spiritual life a wee bit difficult. Hopefully that'll change soon. I think I finally figured out what I want to use as an altar and where to put it, but I have to find the piece first! Story of my life. Anyway, December will be the last month I receive a Box of Shadows. I decided to review it for 3 months then test another company. There are several out there that cater to the pagan community and I would like to give them all a try as well. So let's review November's box and when December's comes in next week, I'll review it as well. I know, I know...I am playing some serious catch up on the blog. 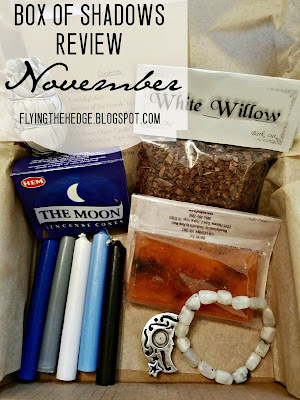 November's Box of Shadows was constructed around the full moon last month. As with every box is came with some candles, sage, an herb, and a couple of ritual trinkets. Let's start with the candles. 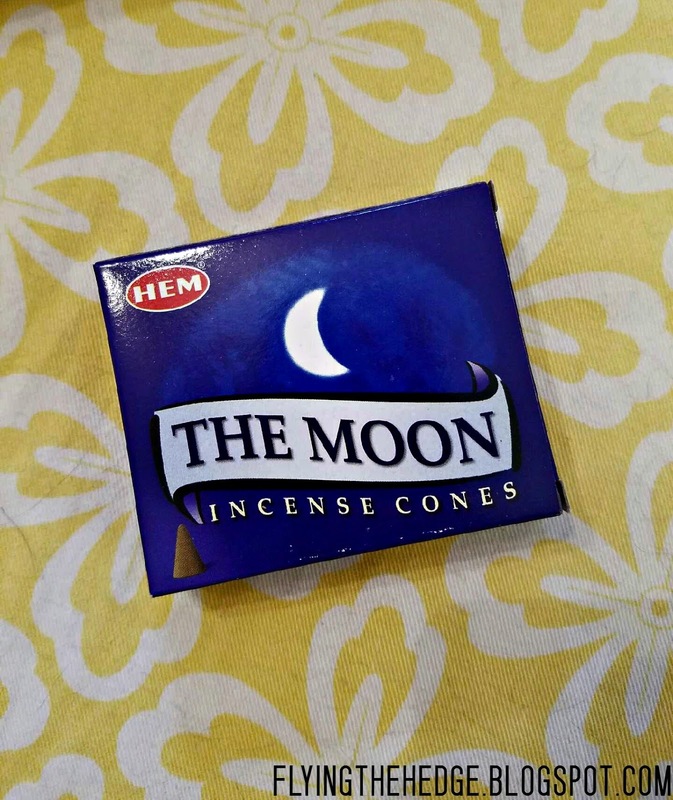 Since this box is centered around the full moon, all of the candles were colors associated with the moon. They are various shadows of blues and silver/grey. I was really excited to get such an array of candles. 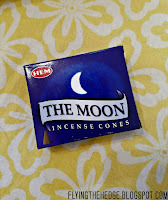 To be honest, I was out of blue candles after using them for a healing spell in October after my go karting accident. I'm glad I was able to restock without making a trip across town to the metaphysical store. Next up was a beautiful moon candle holder. 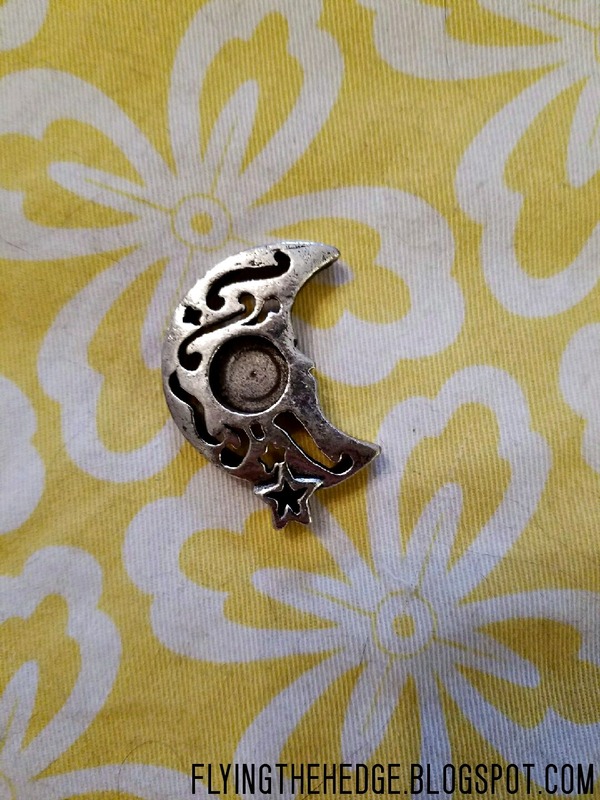 This is PERFECT for esbat rituals and spells or any magic honoring or requiring the moon. 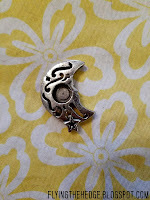 It is gorgeously made in a silver finish and will look beautiful on my altar...if I ever find one. Ha! 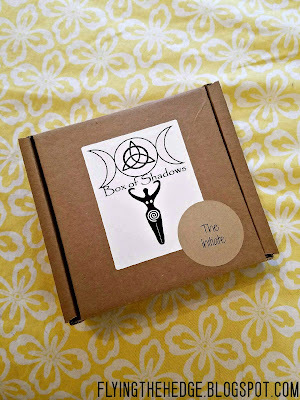 The box also came with some Moon Ritual soap that can be used prior to any esbat ritual to cleanse you and prepare you for the ritual or spell work ahead and some The Moon incense. Another great item for an esbat ritual! 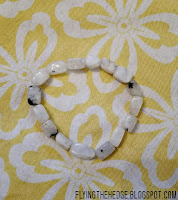 My favorite piece is, however, is the moonstone bracelet. 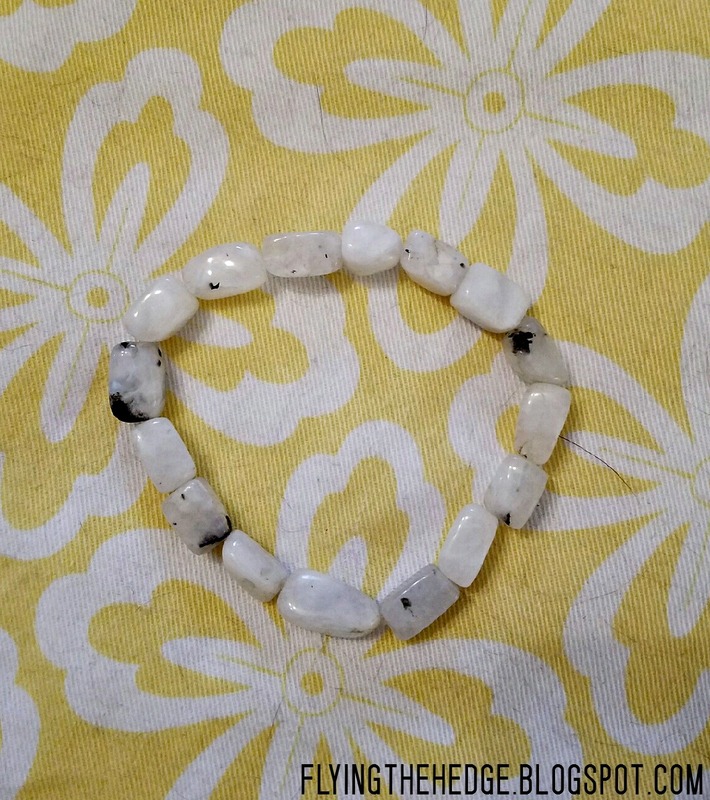 Moonstone is often a pearly white color, as in this bracelet. The silvery, grey color is associated heavily with the moon, hence its name, and invokes reflective, intuitive powers and increases harmony. It brings calmness and tranquility, and is believed to absorb wishes and sent them on their way to the moon. This is something I probably need to charge and wear everyday. Like I said, I tucked everything away without pulling anything out. I could really use some peacefulness and hope right now. Finally, there was of course the white sage and a new herb, willow! Kind of obvious what my favorite tree is and what plant I feel the greatest connection with. 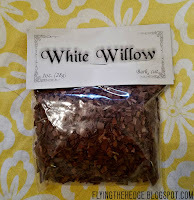 I was super excited to receive some willow last month. Willow is associated with the moon (duh! ), females rights of passage, fertility, creativity, inspiration, emotion, love, protection, and healing. It is often referred to as the tree of immortality due to its ability to regrow from fallen branches. As a pretty artistic Feminist, this tree speaks loudly to me. It brings me great joy to look upon the beautiful weeping willow in my yard. Standing beneath its branches I feel a sense of calm no other tree brings. 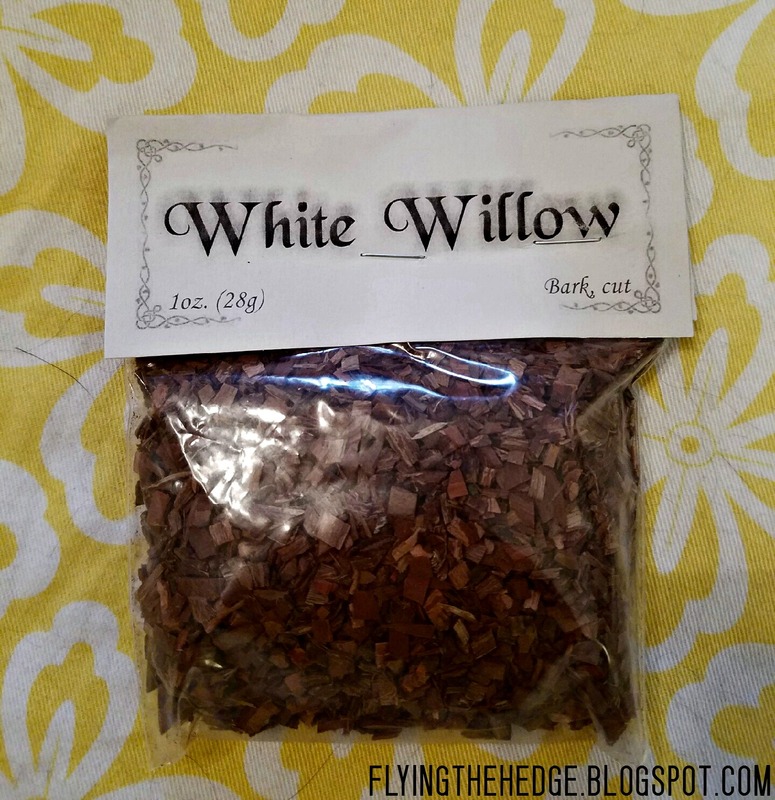 I shall be using the dried willow often while I work on my grimoire to boost my creativity and poor loving, healing energies into it. I have to say I really enjoyed November's box. It couldn't have come to me at a better time, but I guess that is the way the Universe works sometimes. We often send out spells and messages with our basic thoughts, dreams, and emotions without even realizing we've done so. She is always listening and bringing us what we need, not necessarily what we want. I look forward to seeing what December's box has in store for me! Samhain is quickly approaching! Of all the sabbats, this is the time to honor and recognize your ancestors as the veil begins to thin. Many witches and non-witches alike set up altars in honor of those who have passed over. In many traditions it is customary to set a place at the table for all those you have lost so they may join the family for a meal this night. Whatever you decide to do, make sure you remember them. I decided this year to take a different approach to honoring my ancestors. Growing up, Halloween trees were common. Heck, they are still common today. It seems like everyone is either making one or buying one to decorate with this season. The one we had was made by my mother, a very crafty and artistic woman. She makes almost all of her decorations or buys them from other artists. I wish I had the collection of decorations for each holiday that she has, but alas I am still young. I am doing my best to grow out collection. Anyway, I distinctly remember Halloween trees and thought, "Why not use this as a way to honor my ancestors? "And thus the ancestral tree was born! I have a beautiful curly willow in my front yard (and a weeping willow, yay!!) that I recently cut back. I used one of its branches, a old pot, and some foam and moss from the Dollar Tree to set up my tree. Once it was made it sat bare in my library for quite some time. I'm being honest, at first I couldn't decide if I was making a Halloween tree or not. I was going to just put it up and save it for another time, but I said, "No, I need to do something crafty for a change!" In comes the ancestral tree. I started by calling my mom and asking for pictures of relatives. 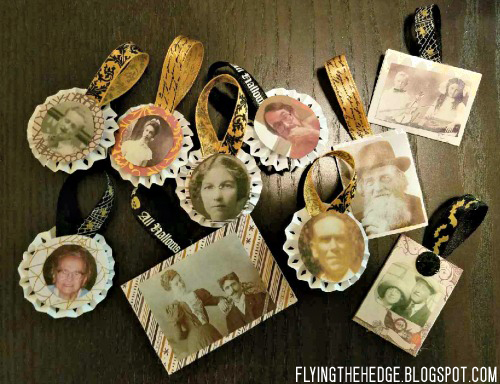 She uses pictures of our deceased relatives all the time in crafts so she already had nice paper copies of most of the family, on both sides of the family...all the way back to when they arrived in the United States on a boat. She also had really great photos of my great grandmother and my grandfather who passed away while I was in college. I made copies of these to place on my tree. Once I had collected all the images I wanted to use I set off to Michael's to pick up some Halloween scrap booking supplies to create my ornaments. I lucked out that they were having a 2 day door buster sale on all Halloween paper crafts. 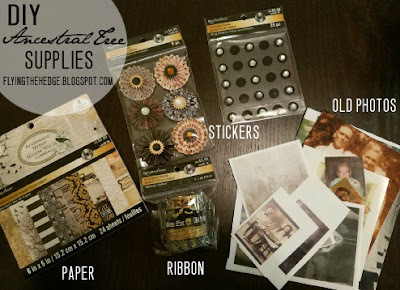 I ended up saving 60% and paying $8 for some very beautiful supplies and ribbon. 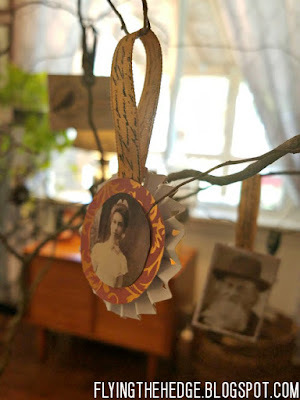 In fact, they already had some paper flourishes that were perfect for the ornaments. I was already going to make something similar and buying them saved me a ton of time. After I gathered all my supplies I set to work cutting and hot gluing everything together. I made several ornaments of different shapes and sizes from many of the people in my family. 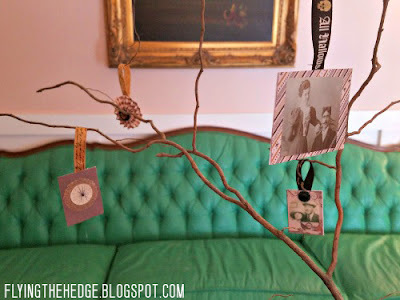 Next year I would like to add to the collection by creating some from my husband's family. 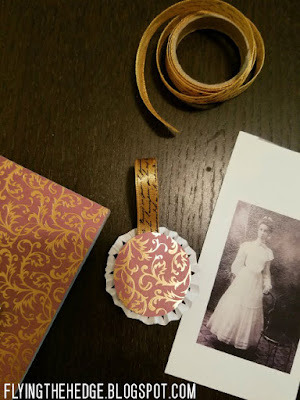 In fact, I should make a note to see if I can't get more of the ornament paper I used before they sell out. Note made. Anyway, once I was finished I hung them up and viola! Simply yet beautiful ancestral tree to honor my loved ones this Samhain. I think it turned out rather nice, albeit I need some more ornaments. There are two people missing from my "family" on this tree; one is my best friend Anna who passed away almost 11 years ago when I was in high school. 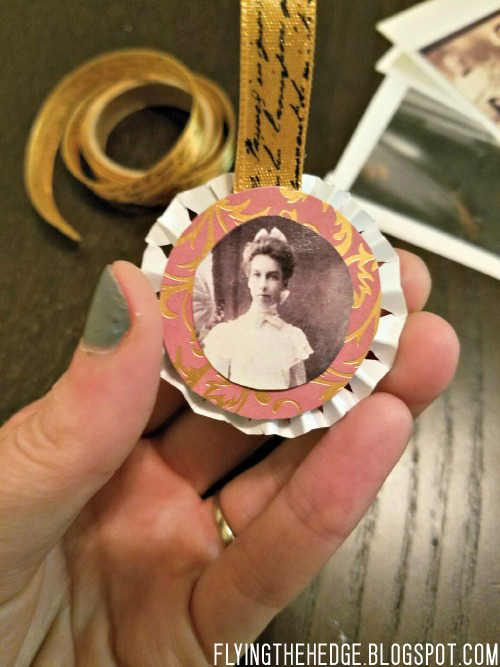 I haven't been able to bring myself to make her ornament, not because I don't love her, but because I feel like making one solidifies that she is actually gone. Even after 11 years I haven't quite accepted it. Please do not tell me she is in a better place. I know you mean well, but those words cut like a knife. The second person is my Uncle Richard. Technically he is a cousin, but uncle works just fine. My mom didn't send me home with any pictures of him. Just know you are remembered and deeply loved Uncle Richard. How do you honor your ancestors and loved ones on Samhain?